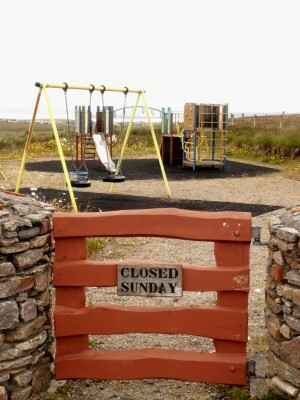 The Sabbath is still taken very seriously on the isle of Lewis in the Western Isles. There may be Sunday ferry sailings, but not much else. Now I don’t care about not being able to shop one day a week, and I appreciate that if the swimming pool is open, then someone will have to work on Sundays (if they were getting paid double-time, like in the “old days”, that might be less of an issue …). There is a lot to be said for a day when work and consumption do not define us. I am hoping that the Sabbath also applies to “women’s work”, and that doesn’t mean that the housework just gets piled up on to Monday. But playgrounds? Eric Liddell would not run on the Sabbath, putting God before country, but at least in the Chariots of Fire version of his life, he does play football with some young lads – not on the Sabbath – so they won’t think “God is a spoilsport”. But today? Still? Banning children from playgrounds when they are trapped inside so much anyway? At least here there are plenty of other places where they can play. This photograph was taken at Garrabost, on the An Rubha peninsula very close to Bayble where Iain Crichton Smith grew up. I think he should have the last word. ’s a chraiceann sleamhainn leis a’ bhùrn ghlas. gu robh an òig’ gun smal. When we were young it rained and rained and rained. Sluicing down its flanks and shanks. A sky-high football of gold. When we were young there were clear horizons. A green land, far, far away. When we were young we were spotless.